For most mountain bikers, going downhill fast is one of life’s purest pleasures. As gratifying as grinding out a long climb can be, it’s hard to top the sweet reward that typically follows: The exquisite icing on the cake that is the descent. Few things can beat the feelings of weightlessness and freedom that come when hurtling down a hill on your bike at high speed. These moments are the mountain-biking equivalent of Transcendental Meditation, when the mantra of a buzzing freehub lulls our minds into a Zen-like calm amid the surrounding chaos. This is when we are truly living in the moment. Our heads are cleared of the detritus of daily life, our energy and enthusiasm is restored and we regain a sense of well-being. In celebration of this gravitational reset-button, we’ve devoted much of this issue to the joys of going downhill. Here’s a peek at what’s inside the June 2016 issue of Bike magazine, now available on print and digital newsstands. With North America's highest concentration of mountain-bike parks, the Northeast boasts gravity options galore. 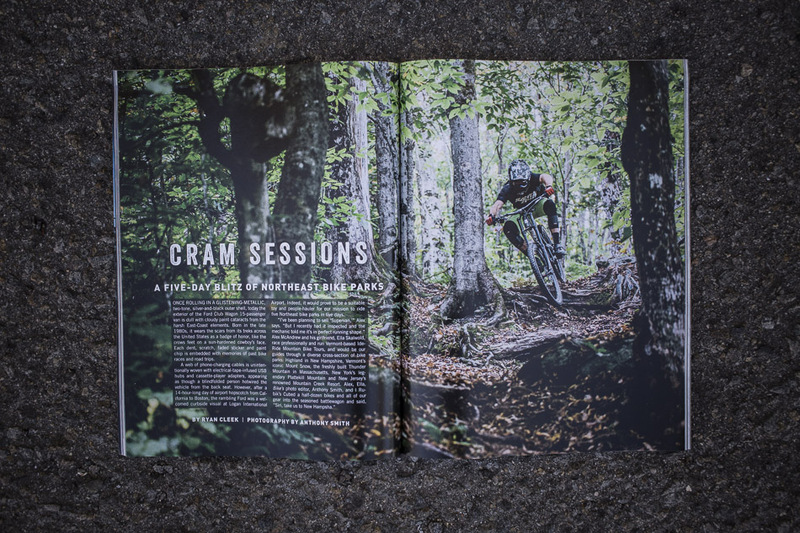 In “Cram Sessions,” we visit five of the region’s archetypal lift-accessed bike parks to experience why the area continues to be a DH stronghold. We find a staggering variety of terrain, from the shale-strewn slopes of New York’s Plattekill Mountain to the machine-built roller coasters of Thunder Mountain in Massachusetts. And with more than 20 bike parks within a few hours’ drive of any major population center, there’s really no excuse to not get down. 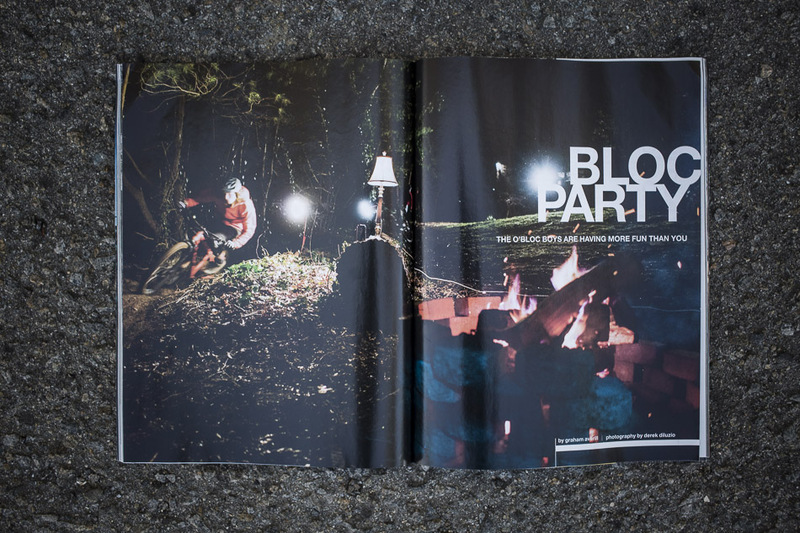 In “Bloc Party,” we look at how gravity has become the binding force in a North Carolina community of young rippers whose lives revolve around the fun of riding downhill as fast as possible. At the ‘O’ Bloc, the shenanigans never stop. Transition is riding a rising wave at the moment—a swell buoyed by equal parts Pacific Northwest working-class sensibility, forward-thinking geometry and a strong sense of humor grounded in an uncluttered, performance-based ethos. 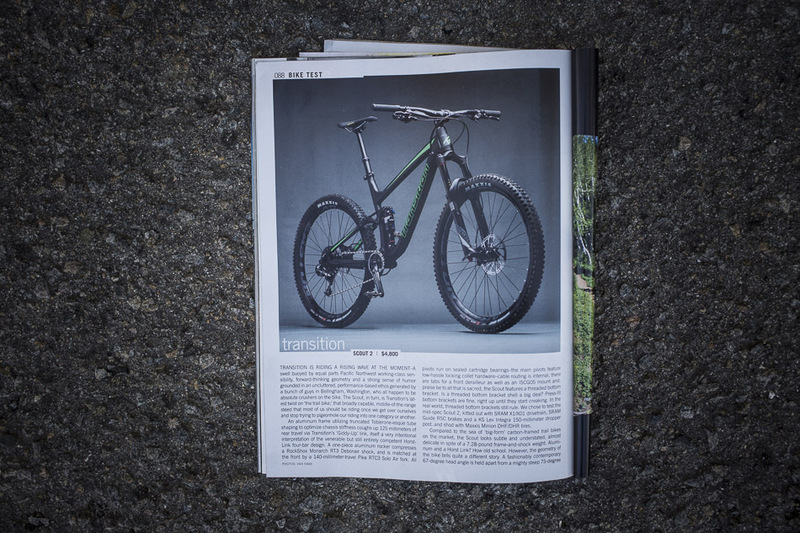 The Scout is Transition’s latest twist on the “trail bike;” that broadly capable, middle-of-the-range steed that most of us should be riding once we get over ourselves and stop trying to pigeonhole or riding into one category or another.